The Bohemian Style, also known as Boho Chic, appeared as a counterculture movement in the early 19th century, in England, but it only became popular worldwide in the 90’s. Back then, the term described the people who rejected the norms of that era. Today, Bohemian is a word describing a style focused on natural elements such as flowers, animals, and patterns based on geometric figures. Albeit it is not hard to recognize the Bohemian Style, not everybody can create a Boho design. Today, we are going to point out some of the main features of the Bohemian style and teach you how to incorporate it into your designs. In the 90’s, a bohemian person would be interested in “art, music, and/or literature, and lives in a very informal way, ignoring the usually accepted ways of behaving.” The term was directed at outcast artists who lived non-traditional lives. Nowadays, though, it means something totally different. It mainly describes a way of living that includes anything from home decor and clothing, to graphic and web design styles. 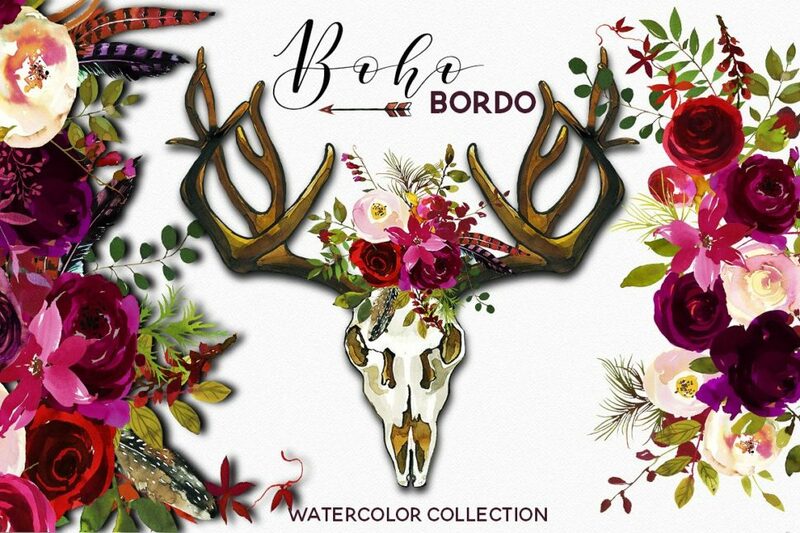 You can tell it apart due to its main themes: leaves and flowers, vibrant colors that pop, layered clothing, visual textures, arrows, horns and antlers, floral wreaths, indoor plants, animal skulls, macrame, mixed geometric figures. Incorporated into a design, these elements will make your work stand out in the crowd. If this is what you want, let’s see how we can get the job done. As you’ve probably deduced, the Bohemian Style cannot be introduced in all your products due to its specific characteristics. It wouldn’t look right to design a boho logo for a construction company, for example. As we mentioned before, Boho Chic is a way of living, so if you are not an adept, it will look wrong. 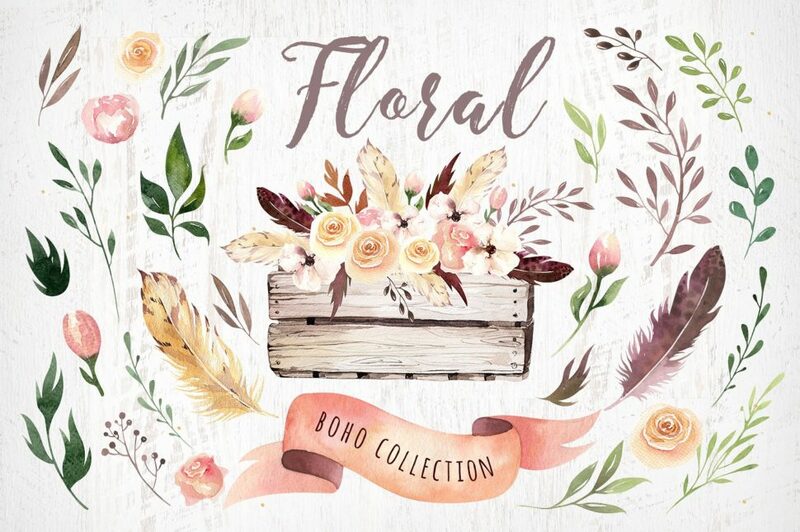 Your clients, instead, might ask you to design Boho websites, business cards, wedding invitations, book covers, product packaging, clothing prints, greeting cards, wall artwork. In this case, you can take inspiration from the collections we listed below, which are exceptional examples of what your Bohemian Style design should look like. 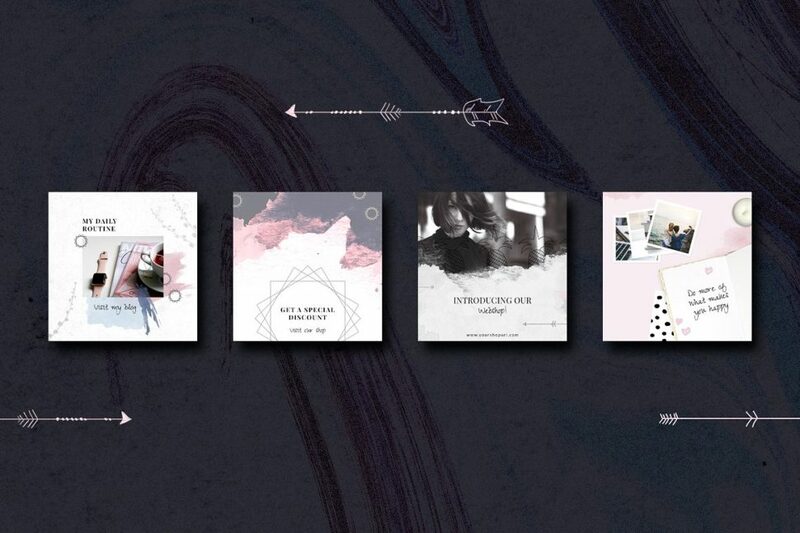 The collection below takes another approach, featuring pastel colors contrasted by darker shades of blue and grey. This choice of colors and shades is specific to the Minimalist style, very popular, as well, among graphic designers. The result? Amazing aesthetics fitted for a more conservative client who doesn’t want a design that screams color. The beauty of this style lays in its imperfections. We rarely have the chance to see perfectly straight lines or perfectly drawn shapes. This will give your design a natural, effortless, yet trendy look. 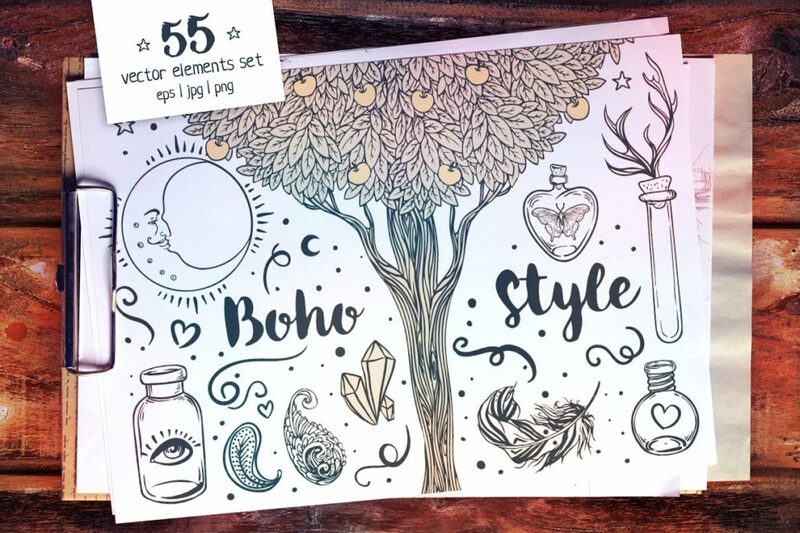 Do yourself a favor and download all the brushes in the collection above and start designing with style… Bohemian Style. 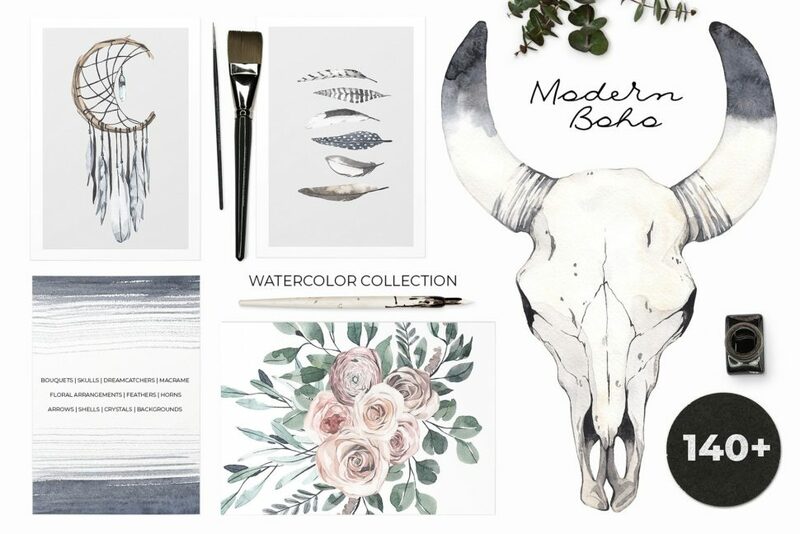 For more Boho Design inspiration on Instagram, follow BohhoSoul. 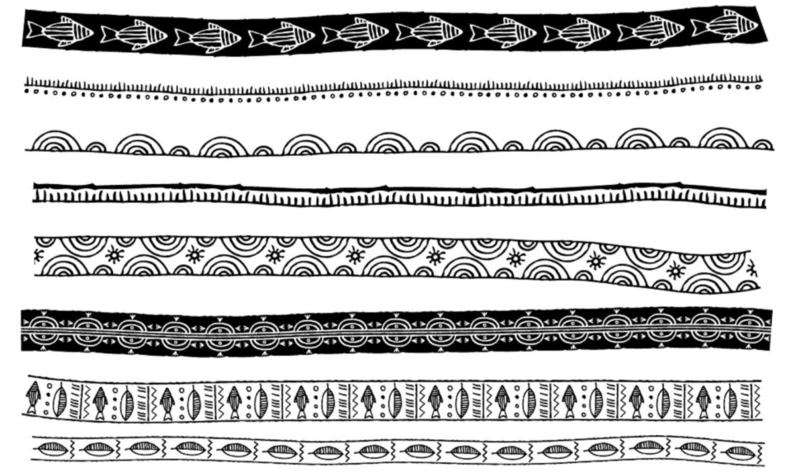 Below, we have listed some more resources that will help you give your projects a Boho touch. 1. Choose your color range from the beginning. If you prefer vibrant colors, make sure you stick to them to the end of your project. Same case applies to pastels. But don’t be afraid to juggle with them. 2. Don’t over use elements. 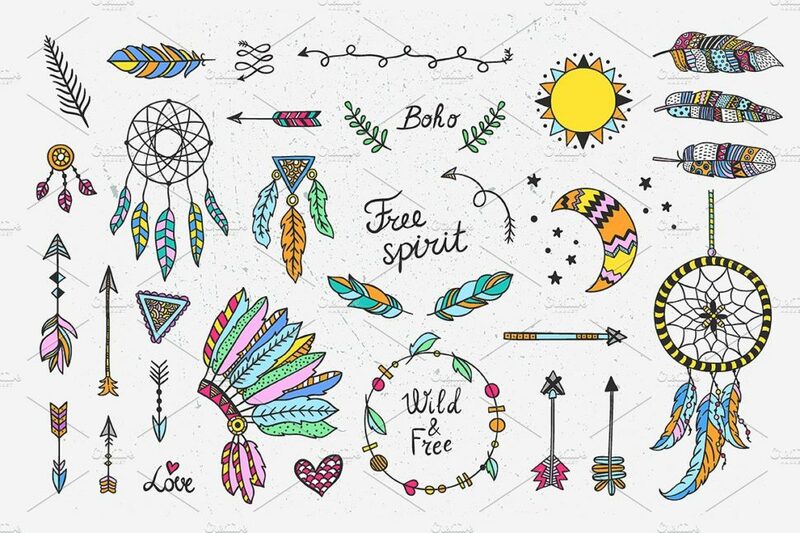 There are plenty of Boho designs already created out there and it’s very easy to get carried away and add too many to your design. 3. Be consistent. When branding a new company, make sure the website, the logo, and the business card feature the same Bohemian elements. 4. Pay attention to your client’s directives. With such a detailed style like the Boho Chic, you might miss some details your clients want. 5. Creativity has no limits. The Bohemian Style offers you the freedom to express yourself through colors, patterns, themes, and so much more. Make the best of it.